Fish Tales: Does Cape Ann Fresh Catch Measure Up? Cape Ann Fresh Catch, the Gloucester-based community supported fishery program, has certainly made a big splash since it debuted last year. Lauded by the likes of Boston.com and Saveur, the program has been popular among those with a desire to eat fresh, locally produced foods. Caught fresh daily by Gloucester fishermen, approximately five pounds of seafood per customer is delivered to seven Boston area communities; Cambridge (two locations), Jamaica Plain, Acton, Lincoln, Marblehead, Gloucester, Newburyport, and Ipswich. There is a two-hour window for shareholders to pick up. Consumers get local, seasonal, super-fresh fish, and the money goes directly to the fishermen, supporting the local economy and encouraging sustainable practices. We subscribed to the winter season, which started in the middle of December. It was supposed to run eight weeks, but due to understandable delays caused by stormy weather, we just picked up our last share. 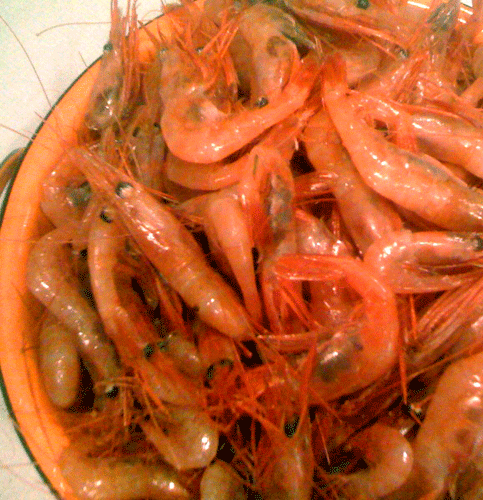 Winter shares included an option for local or “Maine” shrimp, as they are in season. We opted for a half fish/half shrimp share, which meant receiving five pounds of shrimp alternating weeks with five pounds of fish. Sign up was easy and pick up relatively convenient. The CAFC people were great with keeping everyone informed about schedule and expectations via Web, Twitter and e-mail. 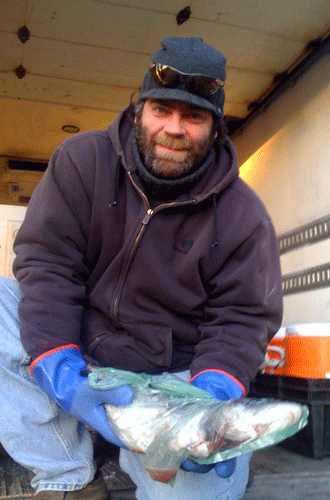 Our delivery guy Steve (pictured here) was helpful and even emailed out a fish cake recipe after chatting about it. The fish itself was incredibly fresh and delicious. If you are used to buying fish at the supermarket, I can’t stress this enough—the difference in taste is phenomenal. Something I didn’t anticipate was the “facing your food” sensation. 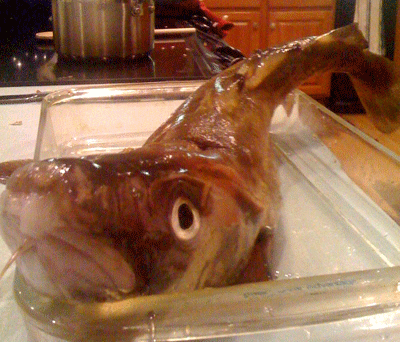 Unlike the bland fillets from a glass case, here was a whole damned fish (thankfully gutted) taking up my kitchen counter and staring at me with his big eyes. Truth be told, I was fascinated. During the season we ended up Googling all manner of fishy facts and watching YouTube videos on everything from filleting techniques to shrimp recipes. We contracted for fresh seafood and got an education in the bargain. So, what’s the catch? (Sorry, couldn’t resist.) Although we liked the program so much we’ll sign up for another season, it’s not without issues. The biggest complaint I’ve heard is the lack of variety. Along with the shrimp, we ended up with cod, pollock, and haddock during the season. This was change enough for me, but we also had several missed weeks due to inclement weather. I can see how one could easily end up with a freezer full of pollock. The shrimp were also a surprise. Despite having grown up on the North Shore, I was unfamiliar with the local variety. Used to big gulf shrimp, these wee pink ones were a mystery to me. The flavor was wonderful: sweet, delicate, and almost lobster-like. But shelling them was extremely time consuming and seemed hardly worth it for the amount of meat harvested. I think next time I’ll skip the shrimp and buy the shelled meat at a local fish monger. That brings us to the question of cost, which figures in at $4/lb for fish and $3.50/lb for fish and shrimp. Sounds like a bargain until you realize that you are receiving whole fish or shrimp that needs to be processed. Even if you’re an expert with a fillet knife, how many edible pounds are you actually buying? Is it worth the effort? Unless you live in a coastal town with a reasonably priced fish market selling dayboat fish you can patronize at whim, the answer is a definite yes. That’s what Cape Ann Fresh Catch delivers—incredibly fresh, great quality fish that helps food lovers support the local economy.